From LAUNCH Mobile Wearables IoT, Jason and Peter Rojas (Engadget, Gizmodo) meet the entrepreneurs on the cutting edge of these industries. First, a fireside chat discussing mobile tech with Scott Croyle from Nextbit; second, it’s the Kitchen of the Future with Timothy Chen from Sereneti Kitchen, Brielle Pettinelli from ROOT, and Stephen Svajian from Anova Culinary; third, Matt Galligan from Circa takes the stage to share his lessons and wisdom about startup success and failures. Don’t miss this! 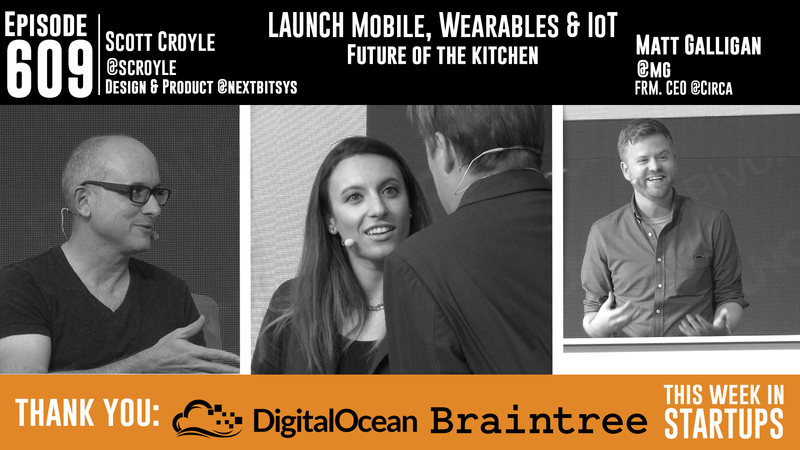 LAUNCH Mobile Wearables IoT was presented by our friends at Pivotal. 01:35 – 06:07 Jason introduces Scott Croyle from Nextbit and they discuss the Robin design and cloud features. 06:08 – 07:38 Jason & Peter discuss the impact of storage and cloud features on the future of phone usage. 07:38 – 09:16 Scott gives Jason & Peter insight on the Nextbit’s Kickstarter campaign and how that helped Nextbit take advantage of disruption in the mobile handset space. 11:19 – 11:18 Scott and Jason discuss how pricing is one of the major areas for disruption moving forward. 11:19 – 13:40 Peter and Jason talk about how Apple’s move toward direct-to-consumer devices is a major shift for the industry, then the conversation turns toward how consumers perceive value in cloud services versus OEM infrastructure. 13:41 – 14:44 Jason and Scott discuss Cyanogen, a major Android competitor, and how they are also placing pressure on Android and Google. 14:45 – 18:09 Jason, Scott, and Peter chat about the pros and cons – from both industry and consumer perspectives – of sticking to the Android/Google CTS versus those companies who are moving independently between apps and app suites. In the course of the conversation, they discuss how customers want to root and backup their phones with services such as Helium. 24:55 – 26:09 Jason and Scott discuss the business aspects of Nextbit. 28:00 – 31:10 Jason introduces Timothy Chen from Sereneti Kitchen and they do a demo of how the technology is changing the cooking experience. 32:27 – 33:33 Jason asks about how to clean the kitchen, and Timothy expands upon the product roadmap and their projected growth and margins. 33:36 – 34:05 Timothy answers how Sereneti has no intention of removing chefs from the world. 36:27 – 37:10 Timothy chats about how the food is changing from a vertically aligned industry to a co-packing industry. 38:45 – 40:15 The final question: Timothy discusses enterprise cost for Sereneti. 40:15 – 42:05 Brielle Pettinelli from ROOT gives an introduction to their product, how it works, and the motivation behind it. 44:30 – 45:20 Jason and Brielle discuss pricing, savings, and the perspective that consumers have about this product. 45:27 – 46:30 Peter sounds off on his thoughts about the two products demoed and how ‘food miles’ and health are driving factors for consumers; Brielle gives her opinion in agreement. 46:40 – 48:01 Jason introduces Stephen Svajian and Anova Culinary; Stephen introduces the sous vide technique and the Anova product. 48:29 – 52:25 Stephen discusses how technology in the kitchen is a macro trend, and how sous vide (and Anova) take advantage of the necessary precision to improve food and life quality. 53:25 – 54:25 Jason and Stephen chat about how the Anova mobile app provides both technical support and content to help consumers onboard and succeed with the product. 55:07 – 56:35 Jason invites Matt Galligan from Circa to the stage to discuss lessons learned for the benefit of the audience. 56:45 – 59:30 Matt runs through the history and features of Circa, as well as the trajectory of how Circa is currently out of operation. 60:00 – 62:00 Matt provides his first lesson: you have to provide the content people want, the way they want it, and it needs to resonate with consumers. 63:00 – 63:50 The second lesson from Matt: not having a board for your company is awesome, until it’s not. Think twice about the benefits versus costs of not having a board. 64:40 – 65:15 Third lesson from Matt: “if you can’t raise a bunch from a few, don’t few from a bunch” because that isn’t sustainable for the long term, and long term vision should be your highest priority. 66:30 – 68:10 Matt’s next lessons are fundamental but important: always be prepared and do diligence, foster team culture, encourage transparency wherever possible. 68:50 – 69:10 Matt underscores that companies and startups have two choices: if you aren’t going at a completely bonkers clip, you need to be making revenue. 70:15 – 71:15 Matt’s final words: when in doubt, do the right thing for the business and for yourself.